Swiss watch manufacturer Certina announced its partnership with Florida-based charity Sea Turtle Conservancy in 2017 and during Baselworld 2018 unveiled the latest timepiece of the collaboration. 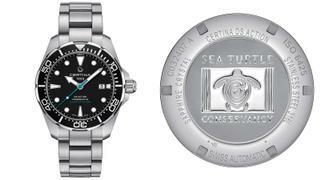 A special edition version of the brand's popular DS Action Diver, the piece is available with a black dial and aquamarine second hand in the same shade as the charity's logo while the STC emblem is etched on to the steel caseback. Equipped with a unidirectional bezel, SuperLuminova numerals and water resistance up to 300 metres it is also an impressively function diving watch. A portion of all proceeds will go towards the work of the Sea Turtle Conservancy. The latest diving watch from Swiss brand Carl F. Bucherer plays tribute to the oceans through a partnership with the Manta Trust. 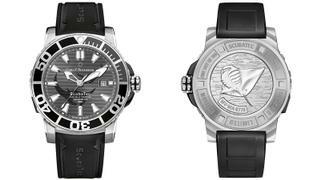 Limited to 188 pieces, the dial shows two elegant manta rays while the reverse of each watch is engraved with a unique image showing the specific pattern of a real manta ray whose picture was taken by the Manta Trust's CEO Guy Stevens. Underneath the engraving can be found an identification number which acts as an access code to a website which allows the owner to name this real manta ray and a portion of the proceeds from each watch will go towards funding expeditions to monitor manta ray populations in the Maldives. Of course, in addition to its philanthropic side, the Patravi SubaTec is an impressive diving watch with 500 metre water resistance, date window and 38 hour power reserve all housed within a 44.6mm stainless steel case. 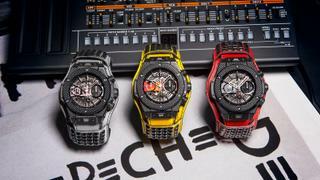 As part of its ongoing collaboration with music legends Depeche Mode, Hublot launched a new limited edition range of Big Bang watches celebrating the band's 37 year career in January 2018. Known as 'The Singles' the collection will feature 55 unique pieces with each one based on the one of band's 55 singles and finished with a partial image of the corresponding record on its dial. Each watch is presented with a Roland JP-08 synthesiser in a cabin-size Rimowa suitcase with the corresponding vinyl and a certificate signed by the band. All proceeds from the sale of the watches will be donated to charity: water - a New York-based non-profit organisation which aims to bring safe drinking water to people in developing countries and of which Depeche Mode has been a supporter for a number of years. 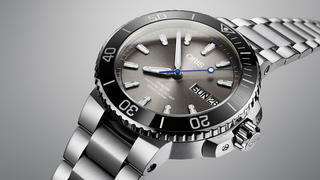 Swiss watch brand Oris has a history of successful philanthropic collaborations with ocean conservation charities and its latest, with shark protection project Pelagios Kakunja, has seen the brand release the Hammerhead Limited Edition timepiece. Profits from the 2,000 piece numbered edition will go towards funding transmitters which will track a group of endangered Scalloped Hammerheads, the data from these transmitters can then be used to advise governments on how to best protect the species through better fishing practices. Blancpain’s Fifty Fathoms model is a legend among dive watches, having been introduced in 1953 for the French navy before finding fame a few years later on the wrist of Jacques Cousteau in his award-winning film The Silent World. 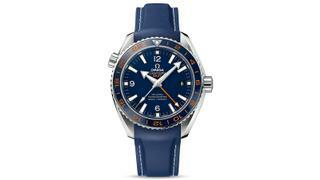 The first Ocean Commitment edition was unveiled in 2013 to raise money for projects and charities concerned with saving the oceans and their marine life. As a renewal of its commitment to ocean conservation, Blancpain introduced the 250-piece limited edition Ocean Commitment II timepiece in October 2016 to raise another €250,000 to be donated in support of marine research and scientific expeditions the world over. 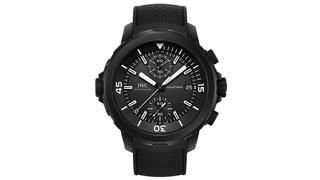 IWC donates an annual six-figure sum to the Charles Darwin Foundation to protect the delicate ecosystems of the Galápagos Islands. 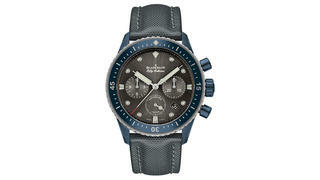 The brand also marked the 50th anniversary of the Charles Darwin Research Station with this Aquatimer chronograph featuring an engraving of an iguana on the case back. A percentage of the proceeds from every one of these special versions of the legendary Seamaster will be donated to the GoodPlanet Foundation, an environmental charity that is currently funding projects to preserve mangroves and sea grasses in Southeast Asia.